I finally redeemed my Groupon for an in-home wine tasting... and wow, it was fun. 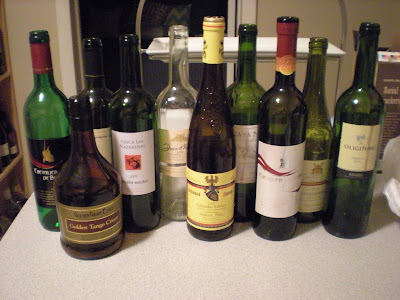 The wine consultant from PRP Wine came to our house and brought several bottles of wine. Due to an address mix-up (apparently there is a different place with our exact address in another zip code), he was late, but to make up for it, he gave us a couple extra bottles of wine to try. And we had plenty of booze and appetizers to tide us over, so no one really seemed to mind. I wondered if the tasting would end up being a pushy sales pitch, but it wasn't. Our consultant was pretty low-key and told us a little bit about the wine, where it was from, and suggested food pairings... and he threw out a few jokes while he poured us samples of each bottle. PRP Wine sells wine from small boutique vineyards, mostly European and South American, that aren't available anywhere else. We tried a few whites, a few reds, and a dessert liquor called Golden Tango Cream that's described as "Bailey's with a kick." Scott and I will soon be receiving the orders that our group placed. 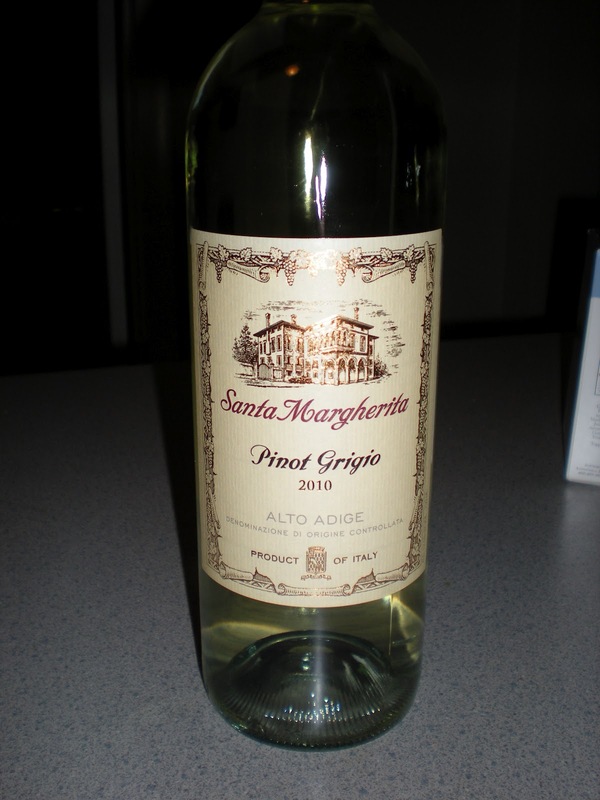 He and I bought one bottle of white (nicknamed the "patio pounder," just right for a warm summer night on the porch), two bottles of Spanish red, and one bottle of the dessert liquor (hey, "Bailey's with a kick" sold me!). 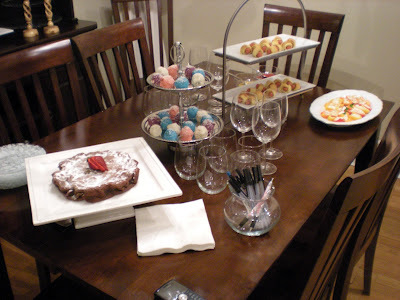 Of course, I also have to give you a peek at the appetizers and desserts I made. I promised Scott I wouldn't be cooking all day, so these are really simple ones. 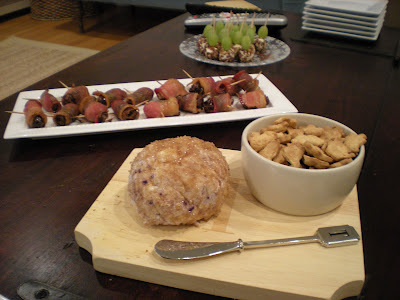 Thanks to those who brought dips, apps, beer, and wine too! Found some inspiration on Pinterest and tweaked the recipe a bit. 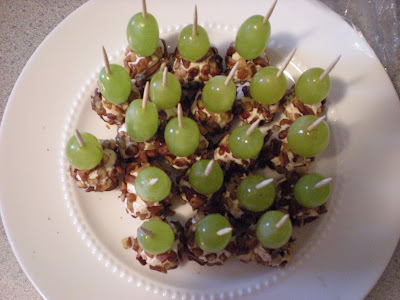 I made small balls of goat cheese, rolled them in chopped pecans, and popped them in the fridge to chill. Then I assembled the grapes and goat cheese balls with toothpicks. Easy! 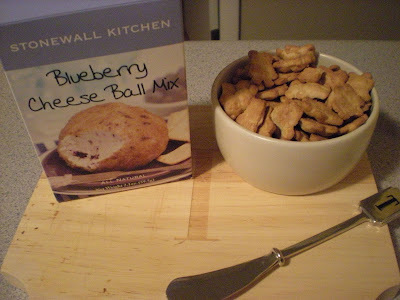 My mom passed this cheeseball mix along. All it required was a package of cream cheese. Mixed the blueberry flavoring into the cream cheese, wrapped it in saran wrap and chilled it for a couple hours before rolling it in the sugary topping. Served with cinnamon-flavored Teddy Grahams. I first made these for Scott's birthday, and this time, I dusted the dates + bacon with a little brown sugar before baking them. These babies were gone before I could grab one! This recipe is simple and a crowd-pleaser. 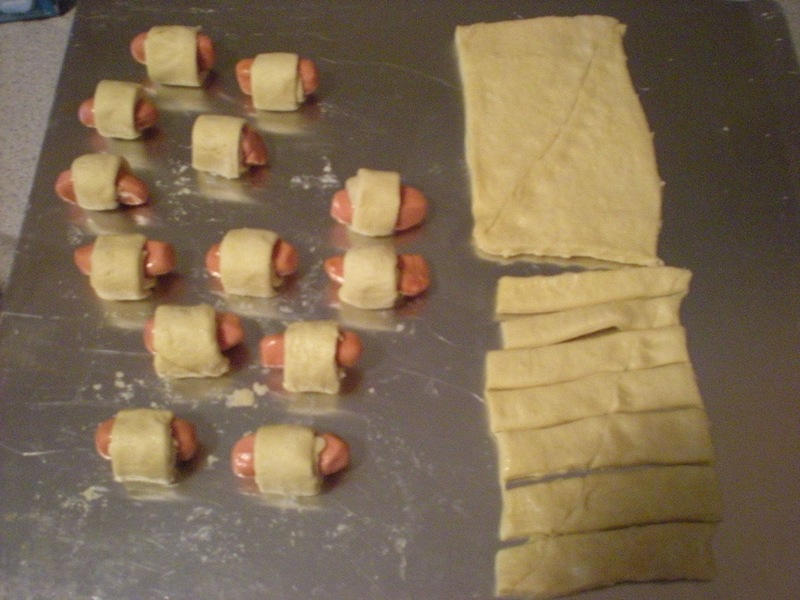 I used Pillsbury crescent dough (rolled out and sliced into strips) and little hot dogs. Just a bit of assembly, about 11-13 minutes in the oven (followed the dough baking instructions), and some condiments on the side... yum! Can you tell that I love these? And I'm not the only one! If you love good food and good writing, you will LOVE this book. 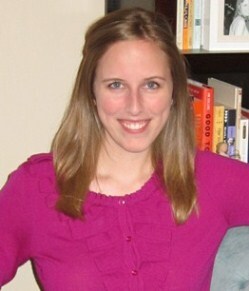 Molly Wizenberg, a freelance food writer and author of the blog Orangette, offers up her favorite recipes from friends, family, or her own experiences and experiments in the kitchen. It's fascinating to hear the story behind each recipe, especially when the writing is as beautiful and decadent as Molly's. This cake was actually Molly's wedding cake (you will adore the story of how she met her husband!). She baked twenty of the cakes for her own wedding... so I couldn't wait to make one myself. It's simple, rich and pretty darn amazing. Like a cake, fudge, torte... all in one. Preheat the oven to 375 degrees F, and butter an 8-inch round pan. Line the bottom of the pan with a round of parchment paper, and butter the paper, too. Put the chocolate and butter in a microwaveable bowl. Microwave on high for 30 seconds at a time, stirring often, until just smooth. When the mixture is smooth, add the sugar, stirring well to incorporate. Set the batter aside to cool for 5 minutes. 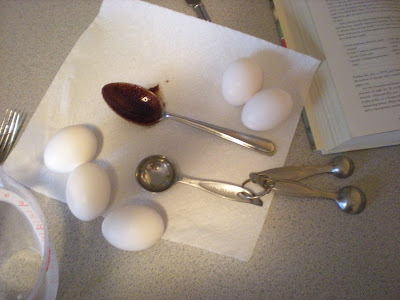 Then add the eggs one by one, stirring well after each addition. Add the flour and stir to mix well. The batter should be dark and silky. 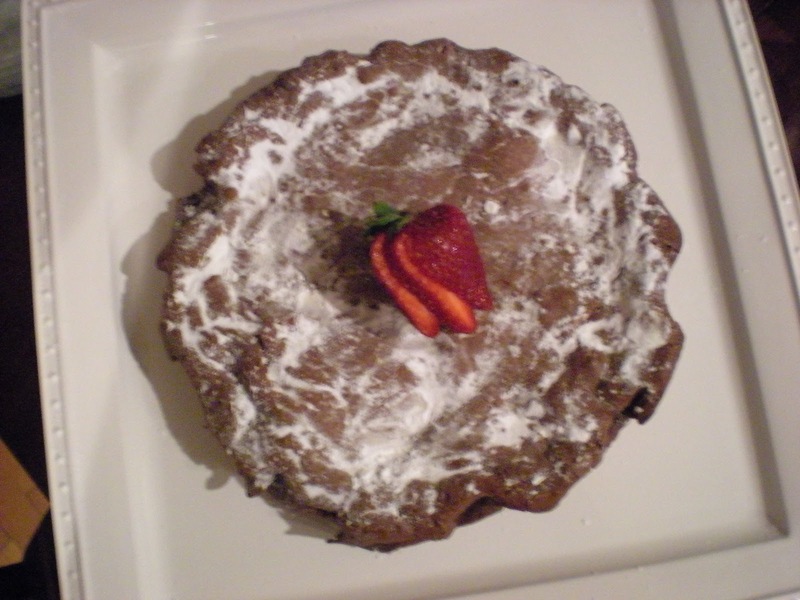 Pour the batter into the prepared pan, and bake for about 25 minutes, or until the top is lightly cracked, the edges are puffed, and the center of the cake looks set. Molly notes that she usually sets the time for 20 minutes to start with, and then she checks the cake every 2 minutes after that, until it's ready. 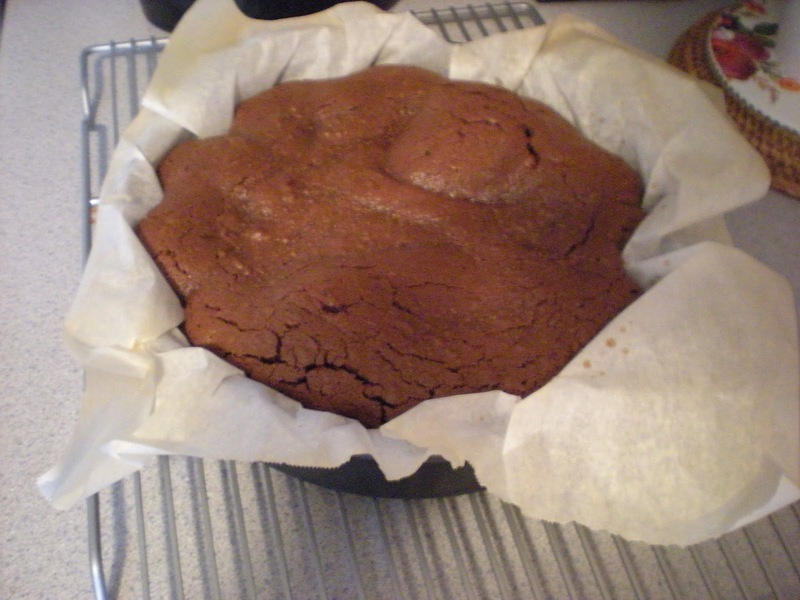 Remove the cake from the oven to a cooling rack, and let it cool in the pan for 15 minutes. 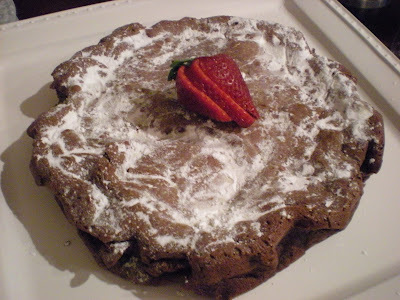 Carefully turn it out of the pan and then flip it onto a serving plate, so the crackly side faces up. 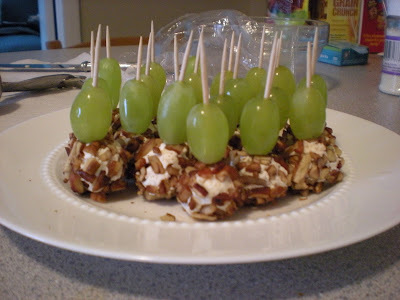 Cool completely before serving, preferably with lightly sweetened whipped cream. 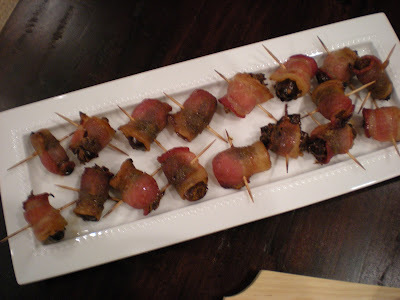 Keeps up to 3 days at room temperature, 5 days in the refrigerator, or a month in the freezer (wrap in saran wrap and then foil). ... And on the topic of wine: last Friday, to celebrate the three-year anniversary of our engagement (March 27, 2009) and Scott's promotion (whoo hoo! ), I picked up a bottle of the wine we drank the night Scott proposed. Cheers! 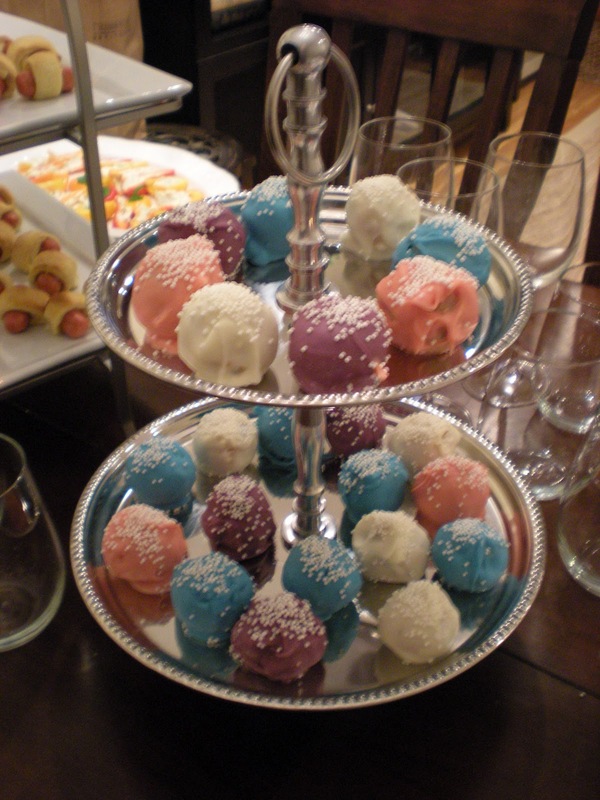 I die inside every time I see those cake pops haha also the cake (and all the other food) looks amazing! I wish I could have joined in on the taste testing..you know how much I love Bailey's! Melissa! 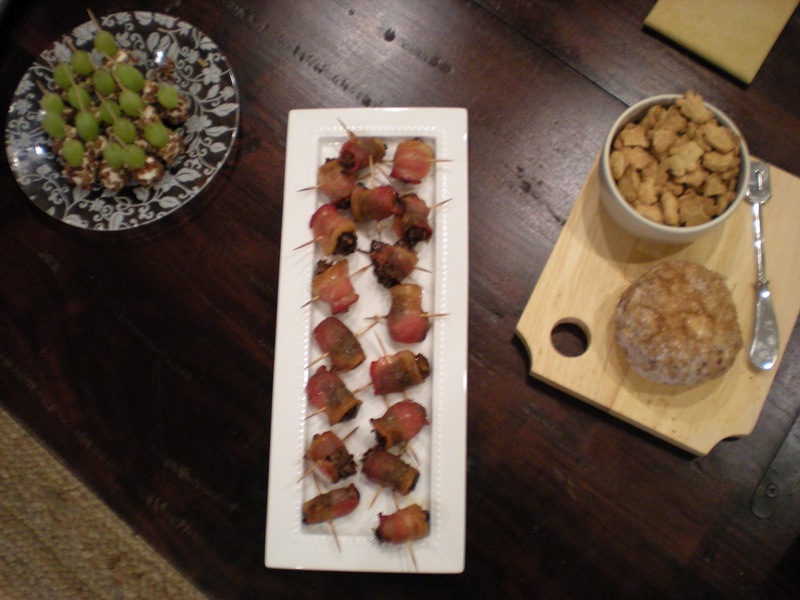 Love seeing all these tasty appetizers! I'm such a fan of serving items like these at parties too. 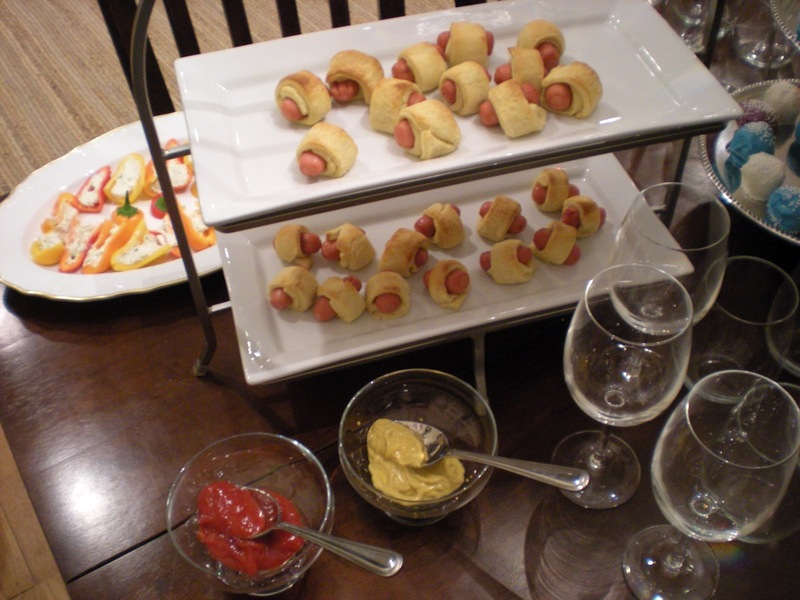 And YES on the pigs in a blanket. I can make ridiculous, fancy, gourmet, delicious new treats, but the pigs in a blanket are always a hit. Everyone loves them! yumm!! those cake batter balls are so cute! Everything looks so delicious!!!! 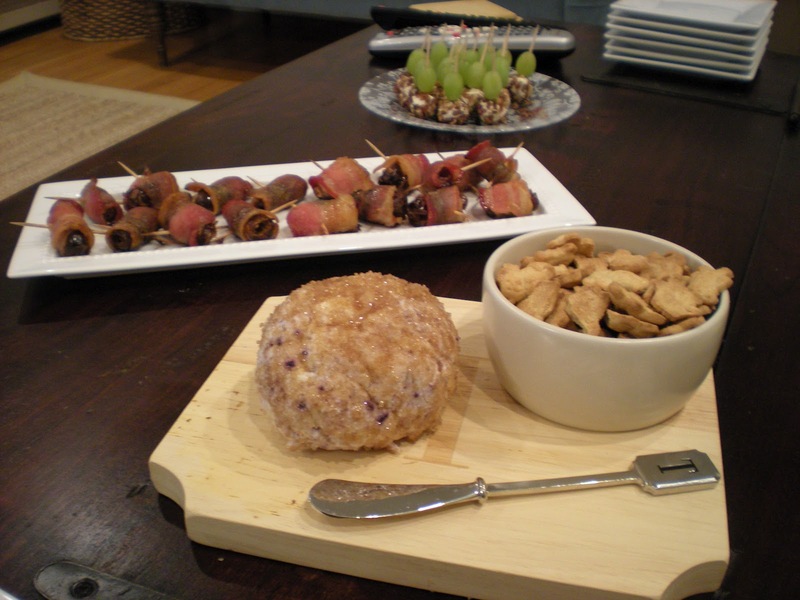 I want to try the blueberry cheese ball dip! The two-tier stand was a gift from my parents for Christmas... it's from Marshall's. They have such great home stuff if you keep an eye out!